SharePoint PitStop: There has been a critical error while processing the form. There has been a critical error while processing the form. 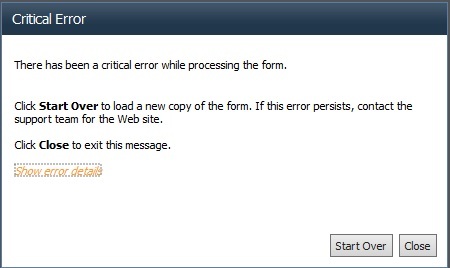 You get the below error message when you use InfoPath Forms on SharePoint 2010 and Internet Explorer 11. Click Start Over to load a new copy of the form. If this error persists, contact the support team for the Web site. Click Close to exit this message. There is an incompatibility with some SharePoint 2010 features and Internet Explorer 11. To fix this, IE needs to run on Enterprise Mode.